Well, I don't know about anyone else, but I am a little tired of snow! We will be CLOSED today due to the inevitable 6-12 inches they are expecting. The Applique' class for tonight will be rescheduled to Tuesday, January 28th. Dance of the Dragonflies expected to start at it's scheduled time tomorrow. If there are any changes it will be posted on our website and an email will be sent out. Bel Air, I guess I will head back home and try to get some sewing done! Hope everyone stays warm and safe! And gets lots of quilting done! All three sessions are FULL, if you are interested in Beginning Quilting classes, please see a sales associate to get into our next session starting in April. We had a great turnout for our Charm Party. I hope everyone enjoyed themselves. We missed a lot of you that I know had collected all of your charms! This class is expected to start as scheduled. However, please check the website or your email before arrival at Hoppin Bobbin. BINDINGS AND EMBELLISHMENTS No extra tools! No silly devices! Learn how to make and apply a straight or bias binding to your quilt. 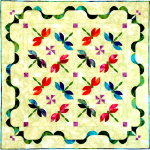 This class will demonstrate and have you work on a small sample quilt of your making. You will then have the sample for future reference plus handouts. We will also cover prairie points and lined prairie points, beautiful finishes or embellishments for your special projects. A designer touch of added piping will make you happy. This class is FULL, if you are interested in taking it, it will be repeated on April 5th from 10-2. We are already taking registration for this class. A great Atkinson Designs pattern using hexagons to create your own year round flower garden! Patterns provided with class. Photo coming soon!